Do you provide wedding services? Then you need to be a part of this one-of-a-kind event taking place on the Opium sim, June 1-30, 2011. 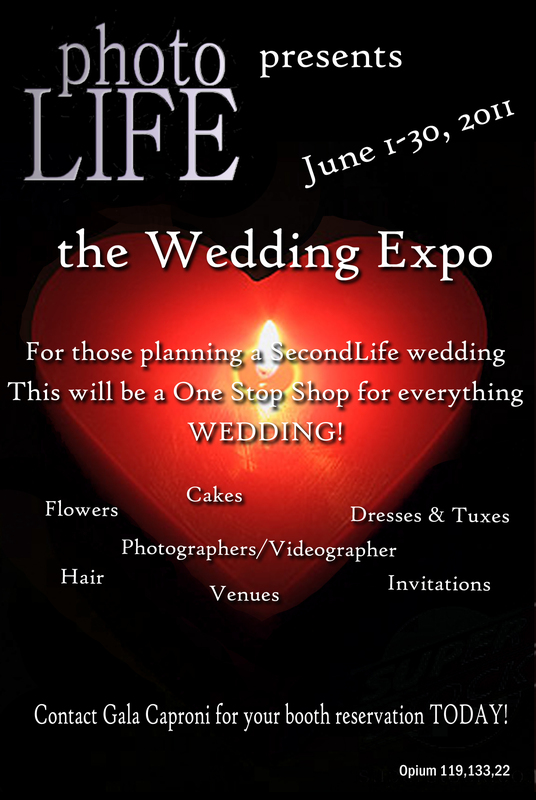 Present your talents and abilities in relation to SecondLife weddings to the brides and grooms of tomorrow. There are 23 10×10 booths available with 100 prims for $400 L each. If you would like more than one booth, we will do our best to be reasonably accommodating. Fee will be due upon acceptance into the expo. You will be notified by May 13th of acceptance and will have from May 23-31 for set up. This entry was posted in Expos, Fairs and Fundraisers, Fashion Community Activities, Events & Feeds, Second Life and tagged bridal, event, expo, wedding on April 23, 2011 by galacaproni.